in line with the national and international best practices against which the Company compares itself. This system is based on some key principles, such as a correct and transparent choice of management of business operations ensured also through the identification of information flows between the corporate bodies and an efficient definition of the system for internal control and risk management. Snam S.p.A. exercises direction and coordination with regard to its subsidiaries on the basis of a specific regulation that enhances its strategic role and at the same time takes into due consideration the legal autonomy and the principles of correct corporate and entrepreneurial management of the Subsidiaries. on the development of technical services focused on distinctive skills and know-how aimed at operators in the gas sector. Policy statement contained in the Anti-Corruption Procedure. Snam, also adheres to the UN Global Compact, the most important international sustainability initiative in the world, which aims to promote and disseminate ten ethical principles concerning human rights, safeguarding the environment, workers’ rights and the fight against corruption. In order to successfully implement this system, managerial actions need to be based on the allocation of specific objectives to each position of responsibility and on the transparent assessment of results. This would enable continual improvements in the effectiveness and efficiency of corporate processes. reporting and regularly communicating management results to stakeholders in relation to the material issues of mutual interest through the report on social responsibility and all the other reporting and communication tools developed by the Company. The groups of stakeholders identified in the mapping activities belong to the following categories: Community and territory, Investors and lenders, Other operators, Media, Suppliers, Customers, People and Authorities and Institutions. The Internal Control and Risk Management System is the set of guidelines, rules and organisational structures aimed at identifying, measuring, managing and monitoring the main risks. Snam has adopted and undertakes to promote and maintain an adequate Internal Control and Risk Management System (“SCIGR”). This system is integrated into the organisational, administrative and accounting structure and, more generally, the corporate governance of Snam. It is also based on the Self-Regulatory Code that Snam adheres to, taking into consideration national and international models and best practices. traceability (guaranteed through the adoption of information systems that can identify and reconstruct sources, information and checks carried out in support of the formation and implementation of the Company’s decisions and financial resource management procedures). The internal control and risk management system is audited and updated over time to ensure it is always suited to overseeing the main areas of corporate risk. In this context, and also in order to execute the provisions of the Code of Corporate Governance, Snam has adopted an ERM (Enterprise Risk Management) system. The Board of Directors charges the CEO with giving structure to and maintaining the entire system. The system is divided into three levels, each with different objectives and associated responsibilities. Identification, evaluation and monitoring of risks inherent to the individual Group processes. This level identifies the functions of the Snam Group owners of individual risks, responsible for their identification, measurement and management, as well as for the implementation of any necessary controls in the field of the processes for which they are responsible. Monitoring the main risks to ensure they are effectively and efficiently managed and processed, and monitoring the adequacy and functioning of the controls in place to protect against these risks; support for Level One in defining and implementing adequate management systems for the main risks and related controls. Within this level, the staff functions of the Group are in charge of coordinating and managing the main control systems (e.g. for Corporate Administrative Responsibility, Corporate Information, Anti-corruption, Antitrust). Independent and objective verification of the operating effectiveness and adequacy of Levels One and Two, and in general of the overall risk management methods. The Internal Audit operates on the basis of Address Lines. The ERM Model, in particular, provides suitable tools for identifying, measuring, managing and monitoring the main risks that could affect the achievement of strategic objectives. The main objectives of ERM are to define a risk assessment model that allows risks to be identified, using standardised, group-wide policies, and then prioritised, to provide consolidated measures to mitigate these risks and to draw up a reporting system. We use an integrated, dynamic and group-wide method of assessing risk that evaluates the existing management systems in the individual corporate processes, starting with those relating to the prevention of fraud and corruption and health, safety, environment and quality. The results of the risk assessment and monitoring activities and the related mitigation measures are regularly presented to the Control and Risk Committee, the Board of Statutory Auditors and the Supervisory Body of Snam and its subsidiaries. They are also used by the Internal Audit department to draw up the audit schedules. Model 231 consists of an organic set of principles, rules, provisions on, inter alia, the management and control of each corporate process, whose purpose is to protect the company from any conduct that may lead to liability administrative, pursuant to Legislative Decree231 of 2001, in relation to crimes committed or attempted in the interest or to the advantage of the company by persons in the so-called “Top” positions within the structure itself or by subjects subject to the supervision and control of the same. The Board of Directors has adopted Model 231 to prevent crimes mentioned in the legislation on corporate administrative responsibility for crimes committed in the interest or to the advantage of the Company, and it has set up a Supervisory Body equipped with autonomous powers of initiative and control, in compliance with the law. The analysis of corporate processes and the comparative analysis of an existing control environment, along with oversight measures, shall be carried out based on the COSO Framework. 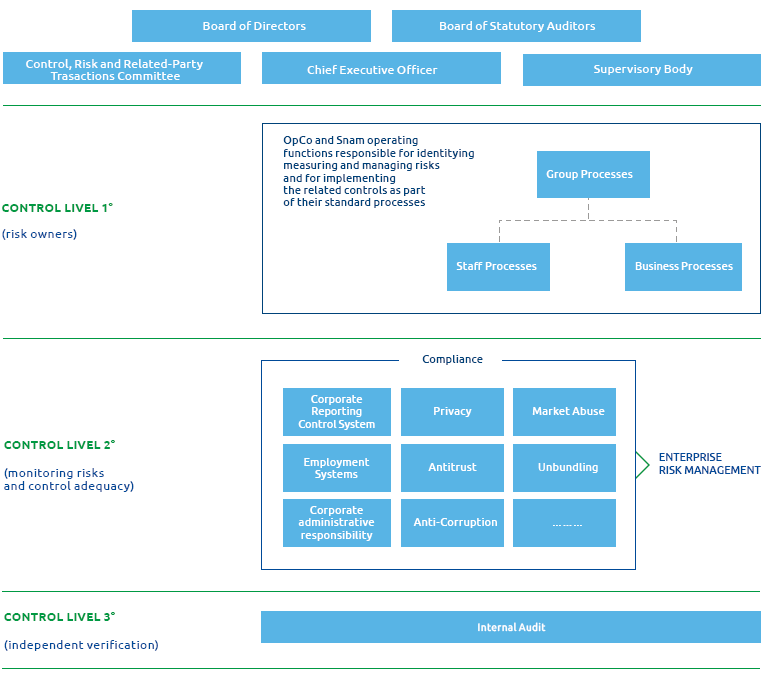 This is the international benchmark model for the establishment, updating, analysis and assessment of internal control systems (the “COSO Framework”, published most recently in May 2013). The subsidiaries have also adopted their own Model 231 commensurate with their own characteristics, appointing their own Supervisory Body charged with monitoring that Model 231 is implemented and applied effectively. of the organisational changes that affected Snam. The updating of the Special Part document of the companies’ Model 231s is being finalised. Snam has developed a specific training programme for all Snam staff. As well as being an important tool for making management and other employees aware of corporate ethics, prevention of the crimes mentioned in Legislative Decree 231 and the fight against corruption, this training activity encourages all staff members to play an active role in Snam’s system of ethics and values. Model 231 is available on the Company’s website (http://www.snam.it/export/sites/snam/repository/file/Governance/modello231/modello_231_Snam.pdf). Lastly, for some time Snam has been preparing, as part of the reporting management process (so-called whistleblowing)58, specific communication channels that the subsidiaries also refer to in addition to Snam. In order to guarantee levels of excellence and independence, Snam has entrusted the management of the aforementioned communication channels to an external subject (Ombudsman), which ensures the receipt and analysis of each report applying criteria of maximum confidentiality suitable, among other things, for the protection of the integrity of the persons reported and the effectiveness of the investigations. Detailed information on the topics discussed in this section can be found in the “Report on Corporate Governance and Ownership Structure 2017”, available on the Company’s website at http://www.snam.it/en/governance-conduct/reports-and-documentation/. As regards the ERM Model in particular and the synthetic representation of the main risks Snam generates or is subjected to59 in relation to its activities and related mitigation actions carried out, please refer to chapter Enterprise Risk Management process (ERM) of the Integrated Management Report. The risks generated or suffered are also described in full in the chapter Risk factors and uncertainties of the Report on Integrated Operations. 56 The Snam Code of Ethics can be consulted on the Company’s website at the address http://www.snam.it/export/sites/snam-rp/repository/file/Governance/codice-etico/codice_etico.pdf. 59 See article 3, paragraph 1, lett. C of the Decree no. 254 of 30 December 2016.